Reagan had another good day today. Fell asleep on her own last night, woke up this morning sweet and smiley! She was a little more "into" her hand today (at times jamming up to 4 fingers down her throat), but otherwise very good. She's been very laid back again today, nothing seems to bother her in the least. 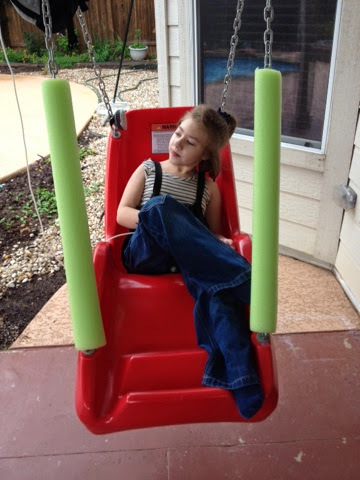 She wore her AFOs, played with the ipad and other noisy things, she was just all around good again today. We did FINALLY get a pool fence installed last week! We're not thrilled with how it looks, but truth be told there is nothing we would have preferred, and it's a very necessary evil. And now we are able to let Ryan loose in the back yard without having to constantly chase him to keep him out of the pool, so that's really nice! Daddy and Ryan went swimming in the afternoon. The pool has finally warmed up a bit and their teeth have stopped chattering...so I think we can probably get Reagan in very soon. Today, however, Reagan and I sat this one out. 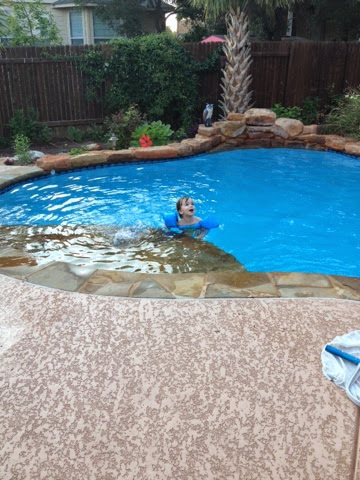 The mosquitoes have been brutal and Reagan reacts horribly to mosquito bites, so we just watched them swim from the comfort of the air conditioned living room! They were out there for quite a while and when they finished Ryan could hardly keep his eyes open! Something tells me someone is going to sleep like a rock tonight! Reagan has been a sweetie today! She fell asleep last night and then slept through til 5:30am or so. She woke up a little vocal and kooky, but settled down once Mike moved her to her chair. She's been SO sweet today. Making wonderful eye contact, has great head control, not overly into her hand or anything...just all around perfect! 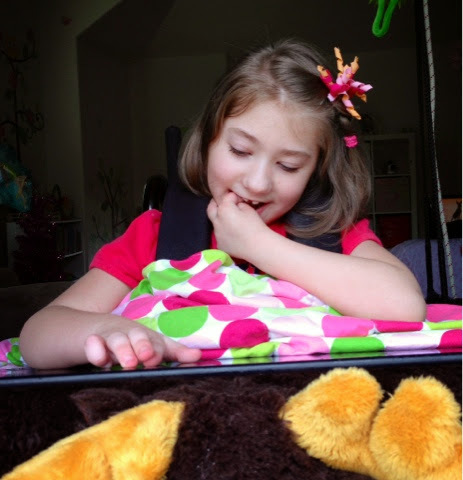 She had a wonderful session with her speech therapist at noon and they worked with the eye gaze device. Then at 2 she had both the OT and speech therapist from school come and she did really great with them as well! And then another visit from her teacher (since Monday was a holiday). We couldn't have asked for a better girl today. She was so attentive and present...so smiley and sweet...really just perfect all day! Tonight she drifted off to sleep again on her own. Such a princess. Sweet dreams! Not the best picture, but they crack me up, both with their hands in their mouths! Reagan was a little restless last night. She did sleep, but woke around 5am and was very vocal. Finally around 6am, you could tell by the tone of her voice that she wanted out of bed. 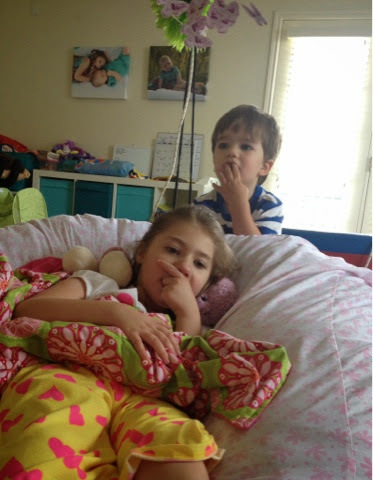 Mike put her in her therapy room with cartoons and I slept in til 7am or so when her brother decided to wake up. We all hung out in the therapy room watching cartoons for a bit. Reagan was excitable and would let out a high pitched squeal every now and then, but I think it was more to get attention than being overstimulated. Her body was actually very calm today. A lot less tension and movement. She had PT at 11 and we incorporated a little parachute time into the end of her session. 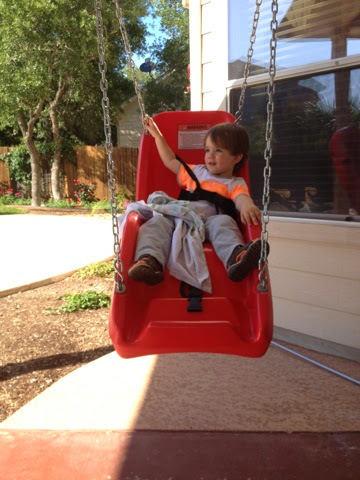 I bought a Gymboree parachute when I decided to pull Ryan out of Gymboree classes. It was his favorite part of the class, so now we can do it at home and with Reagan! They both seemed to enjoy it, although Ryan did get a little crazy when I tried to put it away! Reagan had speech in the afternoon and did OK with that as well. Tonight I left both kiddos with Daddy while I went to Bible study (Grandpa's out of town, so both of us could not go). Reagan was as calm and sweet as can be...Ryan wrecked havoc on the living room while Daddy was on a conference call! 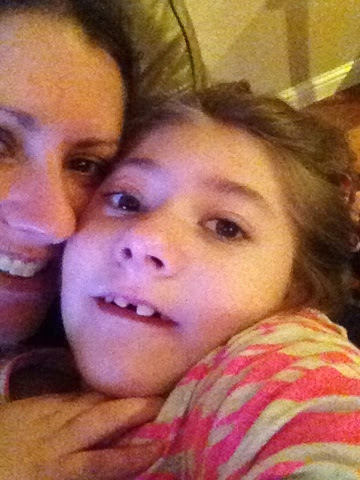 I got home at 9:45pm to find Ryan just settling into bed and my girl super sweet and smiley! I could tell Reagan was tired, she looked so calm and content, but she just wasn't falling asleep. I picked her up and tried holding her, but immediately she got very spitty and chokey (she coughed a huge mouthful of spit in my face), so I had to put her back in her chair where she was more upright. She did eventually doze off on her own, but you could tell it was still a very restless sleep. Mike laid down with her and I peeked in on them to find him snoring up a storm and Reagan laying there opening and closing her eyes every 10seconds or so! I love to see her so peaceful...such an angel! 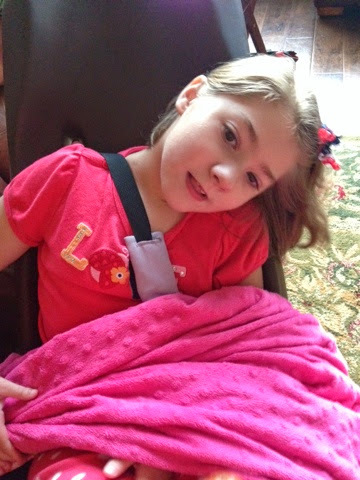 Reagan slept well last night and woke up a sweet girl today. She's definitely been a little more laid back and a little less serious today (we've even gotten laughs out of her quite a few times). 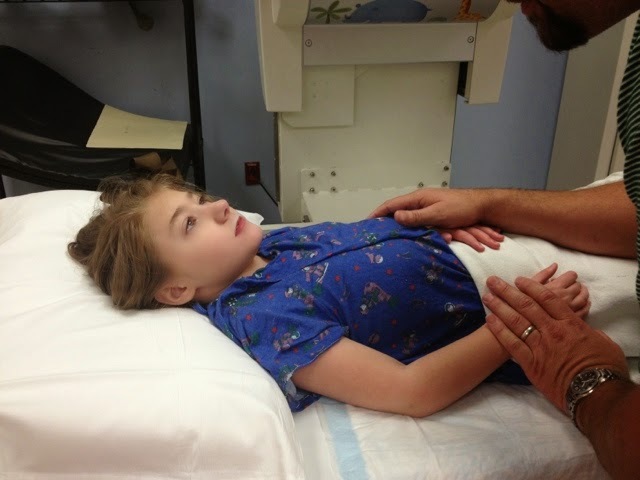 We decided to run her up to the hospital to get her hand x-ray (to look at bone age for her precocious puberty work up). We dropped brother at school and were in and out in no time! It's thankfully a very quick procedure when you have a scheduled appt (we've been there before without an appt and it took hours)! Reagan was great for it and we were back home with time to spare so we spent some time outside enjoying the nice cool weather and her swing! She then had speech, which she did fine for, but a huge (messy) dirty diaper took away from part of her session! In the afternoon she had both OT and school and did great for those, she was a little yawny here and there, but she never actually dozed off all day. Tonight she dozed off early around 8pm but then woke back up when I changed her diaper (we thought she had another poo, but she didn't). She was awake for another hour or two. I picked her up and snuggled with her for a bit, and noticed that she was very spitty, almost gaggy. I'm not sure what that was about, but I hope it's gone when she wakes up! She was a little restless in falling asleep, so hopefully she's able to get some rest tonight! Reagan slept again last night. It was more of a restless sleep, but sleep nonetheless. She woke up a little on the serious side. 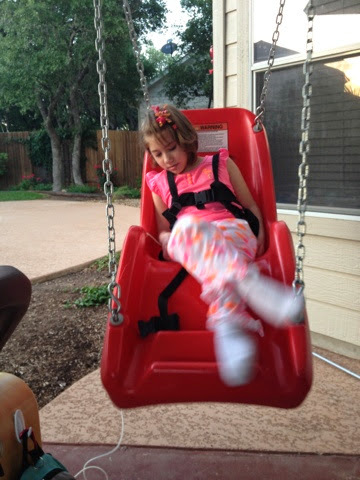 She loosened up a little so we went ahead and let her vision therapist come. It was her last visit of the year until school starts again in the fall. PT came at 11 and Reagan actually fell asleep during the session. She took a nice little nap and woke up just in time to get ready for her 2pm Endocrinology appt. The Endocrinologist basically said she thinks Reagan is starting to go through puberty (precocious puberty) and there's not much we can do about it. Stopping it is not in her best interest. She's still going to do a couple more tests, a bone age scan and more labs, but basically she's just taking the wait and see approach. I'm not really thrilled about it, but I don't know what more we can do. After we got home, Reagan FINALLY had a dirty diaper on her own (it's been looooong time so we were pretty excited)! We gave her a bath and then she started looking really groggy (only a few signs of nausea today, hoping we're done with that). She fell asleep on her own around 7:30pm and she's now snoozing comfortably in her bed. So happy to see my girl getting some sleep (in her bed)! Hoping she can get back on track and feeling more like her happy self very soon! Reagan FINALLY slept last night (thank God)!! And in her bed! I'm so glad my girl finally got some sleep! When she woke up, she was still stressed but smiling, but she was very nauseous. She's a little congested, so I'm not sure if it's the sinus drainage triggering it or what. I tried to suction her nose but I didn't get much. She continued to be pretty nauseous all morning (lots of gaggy faces and retching but no actual throw up). 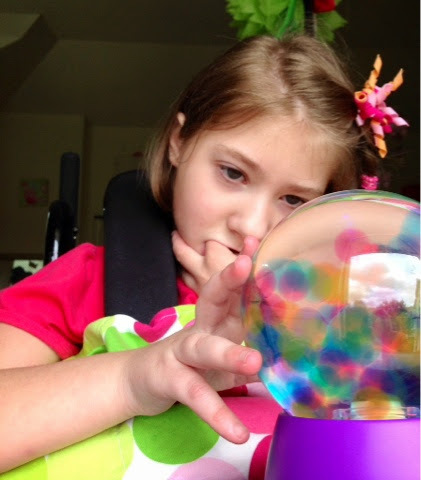 Then her speech therapist came at noon to calibrate the eye gaze device. Yes, we have another loaner. Don't get me started. The company majorly dropped the ball with Reagan's paperwork and it hasn't even been sent off to insurance yet (and it's been MONTHS)! Needless to say, I was pretty upset about this and the Tobii rep agreed to let us have another trial device, hopefully until we get her own. Reagan wasn't very cooperative but we were able to finally get it calibrated and she played "find Elmo" for a few minutes until she was clearly done (she let her therapist know by tapping her with her hand). She was still very spitty and nauseous. 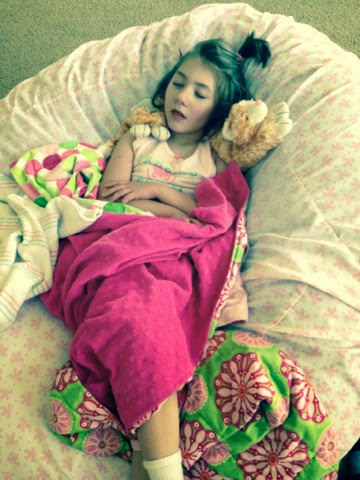 Reagan's nurse mentioned that the ENT she used to work for would use clonidine to help dry up secretions (and it can also help with nausea). So we gave it a try. Not sure if it worked or not, but she fell asleep and then continued to sleep the rest of the afternoon. She did wake briefly and didn't appear to show any sign of nausea but she was still very groggy and quickly fell back to sleep. I honestly don't remember the last time I saw her this nauseous. I don't like it. I'm not really sure what's going on with this last cycle, but everything is all out of sorts! It happened way too quickly, it lasted much longer, there were too many sleepless nights...it was just all around BAD. She's made so much good progress lately with her cycles, I'm just hoping we can get her back to her norm. Last night was another miserable one. Reagan started crying as Mike was carrying her to bed. Needless to say, she never made it and we had to instead put her back in her tomato chair. 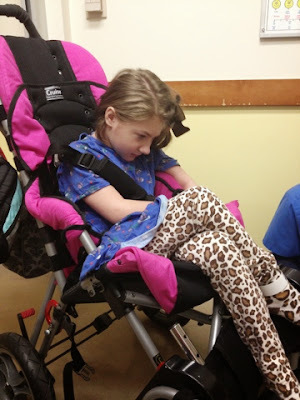 She continued to cry for a while in her chair. It was a very sad pathetic pain sort of cry and there was nothing I could do for her (she had already had all of her pain medications and nothing was working). Eventually she did doze off and we rushed to bed as quickly as we could get there. Again, it didn't last. She was very restless and woke up crying several times. It's just so frustrating to not know what's going on with her or how to help! This morning she seemed to be feeling a little better and even gave us some smiles (although in general she was pretty serious all day). 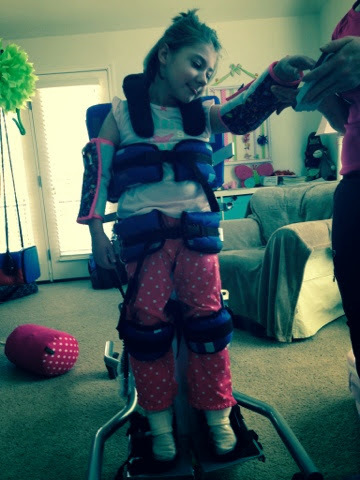 Still very tense, but her temp regulation was slightly improved, and her nurse was even able to get her into her wheelchair and AFOs for a bit (and Grandma got a few smiles)! Still no poo...it's been WAY too long but nothing we've tried has helped her to go. Grandma held her in the poo position several times today and still nothing! Even a warm bath couldn't persuade her to go! Tonight she dozed off with the help of oxycodone (we've had to give it to her off and on all day today) and she seems to really be OUT. Hopefully tonight is the night she finally sleeps! We're going to attempt to get her into her bed! Praying she turns this around soon...I hate to see my precious girl not feeling well. Reagan had another moany night last night with little to no sleep. Medication wasn't really helping. She was OK during the day but definitely more tense than previous days. More "off". Very sensitive (especially to Daddy's voice, which made her cry a couple of times), temperature regulation was way off (hands and feet were ice cold but she kept sweating her back wet), and a lot more chorea. She was happy to see Grandma though...but we had to be careful not to get her too excited. Tonight she was very tense and giving her clonidine actually had a paradoxical effect on her, sending her from crazy to crying in a matter of minutes! Not good. Thankfully Lortab seemed to calm her down enough for her to doze off a little in her chair. I do not have high hopes for tonight. Praying that she can get some sleep and wake up improved tomorrow. We still really have no idea what we're dealing with here. Are these bad days? Is she reacting to something else that's bothering her (ears, tummy, who knows what else)??? Praying for her to get over this soon! 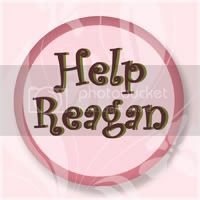 Last night was awful for Reagan, she was very restless and kept waking up moaning over and over again! It was brutal. No clue what was bothering her, completely clueless on how to help her! Very frustrating! This morning she did improve. She actually seemed to get better as the day went on. We did take her in to the pediatrician to get everything checked out, but other than some clear fluid in her ears (no pus or redness), she was good. We did get a prescription for antibiotics just in case it progresses into a full on ear infection over the holiday weekend, but she really thinks it's just fluid in there as a result of her sinus congestion. We'll see. Tonight she did get increasingly agitated again. Lots of moaning and restlessness. Medicines aren't helping her to stay asleep, so I'm afraid we're in for another miserable one tonight. Please keep her in your prayers! It's heartbreaking to see her like this and not know what's going on or how to help her. Reagan woke up this morning at a normal time. She was OK, but you could tell she was a little off. She was congested so her nurse sucked out her nose and got out a good amount of thick snot (she was also sticking her tongue out a lot, but we weren't sure if it was because she was nauseous or just bothered by the drainage). Her body was super tense and she was still very crunchy. 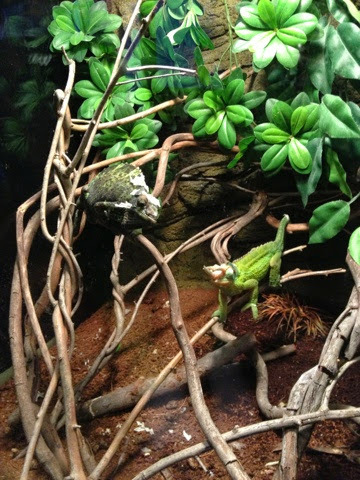 She was making a lot of vocalizations that didn't necessarily sound happy...you could tell she was on edge. Then OT came just before 10 and things escalated. They tried to get her into her wheelchair and she nearly flipped out! Her nurse gave her a dose of oxycodone and she eventually calmed down and dozed off. She was still sleeping when PT got here, so that was a no go, we weren't about to wake her up for anything. She woke back up on her own a while later and again was very vocal. That escalated again to near tears, so we gave clonidine a try. Again she dozed back off. That pretty much sums up her day. Not good. It's hard to call it an actual "bad day" because she never actually cried, but when she was awake, she was moaning nonstop. Poor girl! Something was definitely bothering her and we never figured out what it was! I'm just praying she can sleep through the night tonight and wake up feeling much better tomorrow! Reagan slept all night last night and then just kept sleeping and sleeping and sleeping today! Her nurse changed her diaper several times, she'd move and stretch, but never cracked her eyes even once! Her nurse came and went, an entire shift spent waiting for our sleeping beauty to wake up! She did eventually wake up. Very briefly. Around 9pm she started moving around and Mike went up and saw her crack her eyes open! He scooped her up and brought her downstairs, but she was still reluctant to even open her eyes. She was very crunchy, bent completely in half like a rolly poly, and a little kooky! I changed her diaper, picked the sleep out of her eyes, and wiped the gunk off her mouth before she dozed back off. She was pretty restless after that so I eventually gave her a dose of clonidine and that helped her to fall asleep. Hopefully she'll sleep soundly tonight! It's been another great day for my girl! She slept well last night (with the help of clonidine) and then woke up sweet and smiley again this morning. 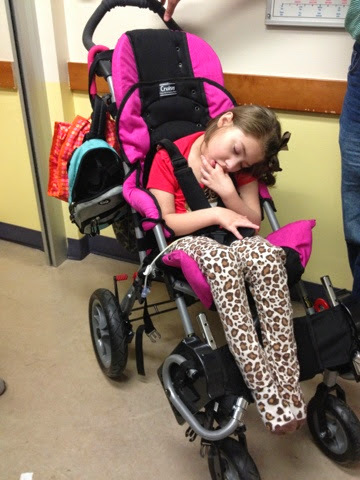 She had a busy morning of therapy, Vision, followed by PT, and then OT! She did great with everything! 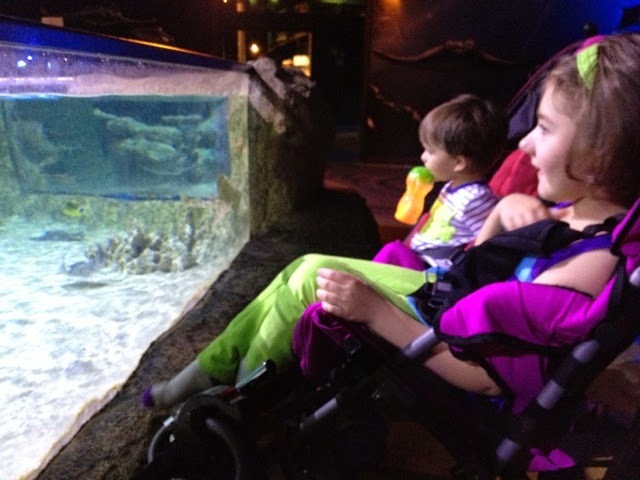 Then after brother woke from his nap, we decided to jump in the car and head over to the Aquarium (because we have to seize these good days while we have them)! 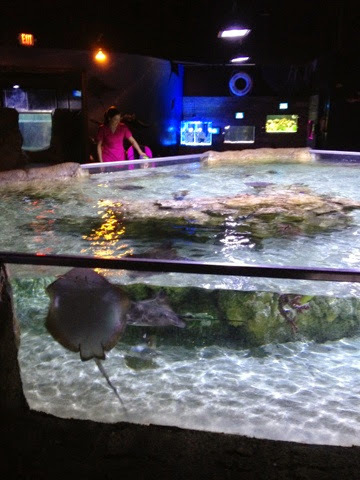 The Aquarium is less than 10min from our house and we like to go after the morning crowds (school busses) have cleared and before kids start getting out of school. 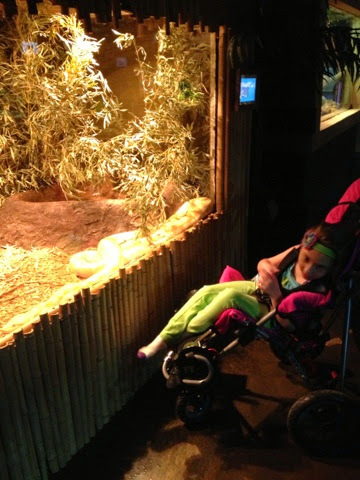 It was a great day for Reagan to go...she was very visually attentive and seemed to really enjoy herself. Ryan, ever a fan of fish, loves it too (although today he was trying to toss stuff into the tanks)! 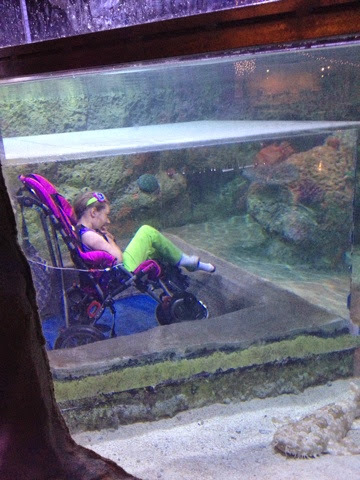 There are some really big, low tanks that are great for both kids to have a close up view while still in their strollers! 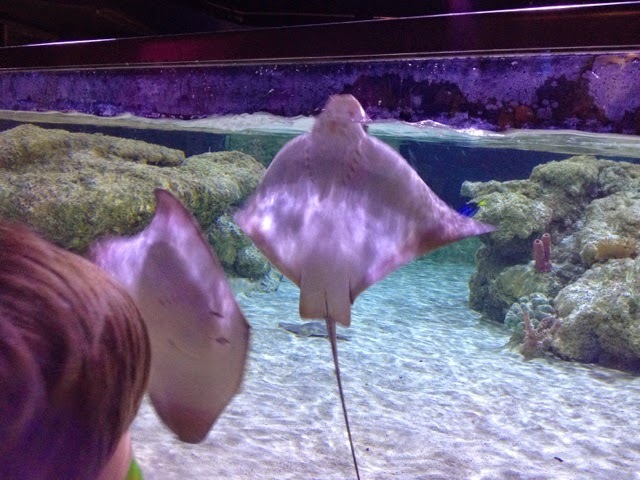 The rays are always a big favorite! 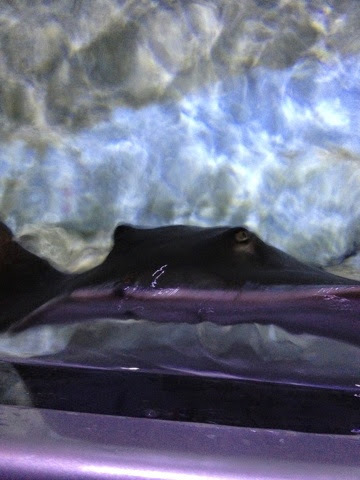 They're very friendly and seem like they want to jump out of the tank! Reagan had a great day today. She slept well last night, falling asleep on her own (without any medication) for the second night in a row. She woke up this morning super sweet and smiley! It definitely seems we're back to good days once again! We went on a walk this morning. It was still nice and cool but a little windy...thankfully she didn't seem to mind at all. She had speech this morning and then school this afternoon and she did great with both! She's been a perfect girl today. Easy going, loving story time, just a darling girl! Tonight I had some cuddle time with her and she was just so precious! I was trying to take a picture of her with my cell phone, when all of a sudden she said something that sounded exactly like Grandma! I think she thought I was face timing Grandma! So needless to say, I had to call Grandma up so she could talk with her! Such a sweet girl! Reagan slept well last night. She woke up this morning, still a little serious, but even better than the day before. As the day went on, she definitely loosened up a bit and even gave me some laughs. Of course, they were associated with gassy poopy diapers (she had 3), but whatever floats her boat! She's still a little mouthy (sticking her tongue out a lot), but we started her back up on the Zofran so hopefully that will keep any nausea at bay. It was nice in the afternoon so we went and sat outside while crazy Daddy and Ryan went swimming! The pool is still WAY too cold for Reagan...we're beginning to wonder if it's ever going to warm up! Ryan's teeth were chattering the whole time, but he just kept running and jumping back in! It's always torture trying to get him back in the house afterward...I'm sure the neighbors wonder what on earth we're doing to him with him screaming the way he does! Still no pool fence. We've got a new company now that is supposed to install it next week. I can hardly wait! It's such a battle right now with Ryan trying to run into the pool every time you let him out the door! Reagan didn't last long in her bed last night. Around 1:30am I had to transfer her back to her chair. 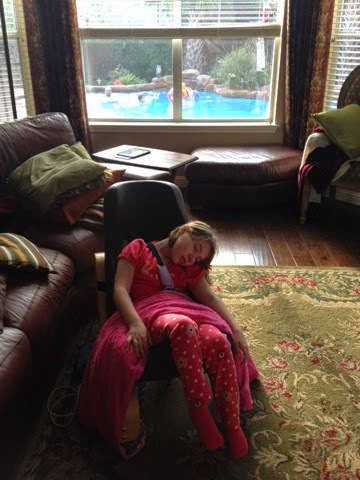 She settled down once in her chair, but didn't immediately fall back to sleep. I think she slept off and on, but obviously a very restless sleep. This morning she was considerably more calm (than yesterday afternoon). Still very serious, but no more crying. We spent all morning up in her therapy room with Ryan watching cartoons and she didn't even seem to mind. This afternoon she started looking really sleepy but she only dozed off for a bit. Tonight we went over to our neighbor's house for dinner. Ryan jumped on their trampoline until his heart was content and Reagan fell asleep in her stroller shortly after we got there! We had a good time and it was nice to get out of the house...even if it was just to go one house down! When we came home everyone was exhausted. Reagan was already asleep, Ryan went down almost immediately, and even Mike is already snoring away! Time for me to finish up meds and attempt to get to be before midnight for once! Hope everyone is having a relaxing weekend! Reagan finally slept well last night! After a couple of nights with little to no sleep, I'm so glad she finally got some much needed rest. However, when she woke up this morning, she was not the happy smiley girl we were expecting! She was very serious, but stable. She refused to give us a smile, but she didn't seem to be annoyed or even sensitive to her brother's crazy antics. She had speech around 11 and tolerated sitting in her chair and making choices (which she did amazingly well using her hands...still have a huge hold up with the eyegaze device but we're getting another loaner next week). Then this afternoon while her brother was napping, she dozed off for a bit but then woke up hysterical! Talk about SHOCK! We really thought we were out of the woods as far as bad days go and that we were looking at smooth sailing this weekend (which would have been optimal since we don't have a nurse all weekend). But apparently what we thought was a super mild bad streak earlier in the week, was just some off days leading up to this! Which makes sense now that we think about it, because the last several bad streaks were preceded by a day where she seemed much more calm and relaxed (yesterday). Ugh. Talk about a surprise...a bad surprise! She cried off and on all afternoon. She dozed back off with the help of oxycodone, later woke up crying again but dozed off with clonidine. Tonight she was awake for a while and very tense, but not crying, but then dozed back off and woke crying once more! Lortab helped her to finally doze off tonight and she's been sleeping ever since. She's still in her tomato chair...not sure if we should attempt to move her or not! Poor thing. She's definitely been miserable. Hoping she'll sleep tonight and wake feeling much better tomorrow! Thank you for keeping her in your prayers! Reagan did not sleep well last night. She was very restless and around 2:30am I could hear her awake and kicking around in her bed! I got up, changed her diaper, and put her in her special tomato chair. I think she eventually went back to sleep because she did quiet down, but she definitely didn't sleep much. When I got up this morning she was wide awake, still very tense in her body, and kicking...but on a good note, she was smiling! She's actually been very smiley today. She's not 100% yet, she's still having a lots of movements, gnawing at that hand, and temperature regulation is off, but otherwise she's been great! 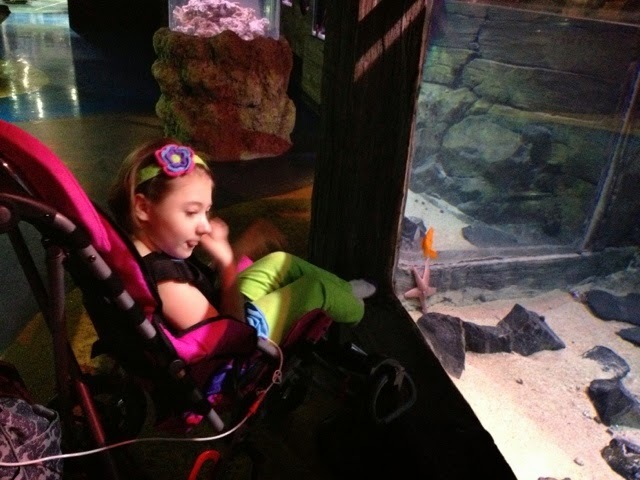 She had school today and did great for that, but no other scheduled therapies. Tomorrow will be a much busier day in the therapy dept. Tonight she was still very tense in her body and difficult to hold (I was trying to get her out of her chair because she gets so sweaty). As she was falling asleep, she kept jolting back awake and becoming stiff as a board! Mike eventually just took her up to bed, but I have a feeling she's going to do that a lot tonight. Hopefully she's still able to get some decent sleep! Such a sweet girl! The boy has been doing well at school. Finally getting used to some of the routine, but still having issues with transitions. Today his teacher was trying to get him to say "I want some juice" instead of just grunting/fussing at his cup and he was getting frustrated with her and finally she said he just yelled out "I WANT SOME JUICE!!!" And she gave it to him! Of course I tried that with him once he got home and he eventually just resorted to screaming, hitting, biting, and pinching me and then throwing himself on the floor! Still work to be done, but progress nonetheless! While he was screaming I saw in his throat again and his tonsils are both covered in pus still! Not sure what that's about and why it hasn't cleared up since it's been almost a week! Poor guy...if we could just get him healthy! So frustrating! Thankfully he doesn't seem to be feeling bad, but who knows. Reagan slept OK last night. She woke up still tense today but OK. There were a couple of times that she would almost go over the edge, but she never did. We had a seating guy come out to adjust her wheelchair this morning, her headrest was all out of whack and we needed some room in her foot straps (for her AFOs). 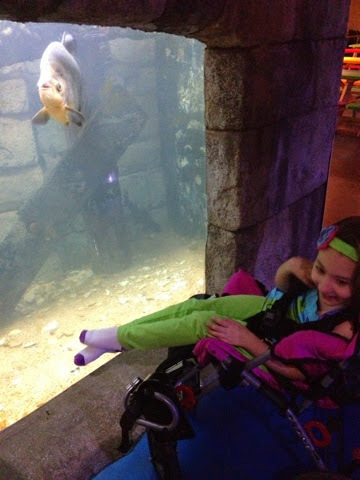 Apparently she's been growing a bit, so we're going to have to see what our next options will be as far as growing this wheelchair (that will be a different appt)! Afterward, we took her in to the pediatrician to get checked out and everything looks good! They took a urine sample and it came back completely clean. So no UTI...that's good news! I didn't really think she had one, because any time in the past that we suspected one, it always came back negative. So from what we can tell, this is either a much milder form of bad day (you really couldn't even call it bad, more like "off"), or it's off days leading up to a bad day (hopefully not)! She's definitely having lots of temperature regulation issues, super cold clammy hands and feet and hot sweaty back (I had to change her pajamas 3 times tonight because she was sweating them wet)! She's got a lot of movements and keeps that left hand in her mouth at all times, so she can jam it down her throat gnaw it red! She seems to be most calm when being held or even just holding that arm down helps, I don't think she enjoys canabalizing her hand like that! Poor thing. She's also way overdue for a poo but still way too tense to go! Hopefully she'll ease up soon and relax a little! Sleep is not looking good tonight, but hopefully she'll get some! Reagan's had an OK day today. She slept well last night but woke up very crunchy and tense...and has been that way pretty much all day today. She's had a few moments where she's relaxed a bit and been super sweet and precious, but most of the time she was tense, with the occasional moan and squealy outburst. She definitely seems to be having some pain. She's overdue for a poo, but the fact that she fussed everytime she had a wet diaper today, led us to suspect a UTI. There have actually been many times in the past when I've suspected a UTI but she never had one. This afternoon I put a cotton ball in her diaper and then tested the urine and it didn't look good. She's got high leukocytes, protein, & pH. Her pediatrician wants us to bring her in tomorrow so they can get a clean specimen to send off. Poor girl. She was even more antsy/fussy tonight. Even oxycodone/Lortab wasn't calming her down much. Her brother was driving her nuts and was getting crazy jealous with all the attention she was getting! At one point, I was sitting on the floor with her on my lap and he came up behind me and put his head on top of mine and hung his arms over my shoulders. Pretty pathetic! Reagan had to be held though because she was really gnawing at that hand! We had to hold her in a position where she had no access to it! And she is so crazy strong, we were wrestling her all night long! I'm hoping and praying she'll be able to get some sleep tonight, she's just been so restless and there are some serious storms outside, hopefully the thunder doesn't wake her! Reagan slept well last night...much better than I did that's for sure! To say I was freaking out was an understatement. I had many concerns...who do I call, when do I call, when do we go to the ER, will they even have her tube in stock, will there be a radiologist on call that can place it??? I was totally freaking out! At 8am I called the GI doctor on call and he told us we should take her to the ER. I also texted her pediatrician and he agreed and said he'd call ahead to let them know we were coming. Reagan went all night without feeds but this morning we were able to connect her extension (and hold it in place) and at least get her medicines into her (we flushed them with formula). After we finished a lightening round of meds, we left brother in Grandma's care and headed to the hospital at 9am. They took us straight back thanks to our pediatrician calling ahead of time. Reagan was good but slightly tense (not 100% good like yesterday). They checked her sugars just to make sure they were stable after going all night without food...all was good so they didn't even put in an iv. Thankfully they had her tube size on hand as well as a radiologist on standby. The placement went smoothly and we were headed home just before noon! Reagan fell asleep just before we left and then slept the whole drive home and then almost the entire day! I guess today was her sleepy day? I'm just glad all turned out well! Thank you so much for the prayers! Crisis averted. Reagan was fighting sleep a little last night, but eventually dozed off in my arms thanks to clonidine. 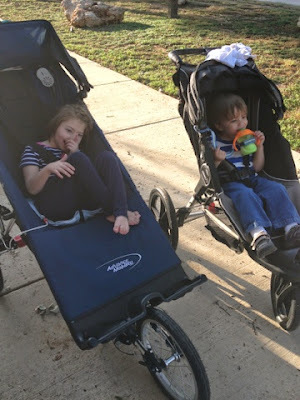 She woke up again early this morning around 6:40am (and of course her brother followed behind her). She has been SO wonderful again today. So smiley, so sweet, laid back...just perfect again! Grandma was thrilled to see her doing so well! We just never know from day to day, so it's always a gamble. My mom and I went for a mother's day lunch today (wanted to miss the Sunday crowds). We went to a place in Austin called Trudy's. It's mexican food with an Austin flair and it's SO good...seriously like my new favorite place (too bad it's so far away from our house...near the UT campus). Then we drove around Austin and we drove by the house she and my Dad lived in when I was born. So much has changed, but the neighborhood is still very similar and the house seems (according to her) to be exactly the same! It was a good day. Reagan was great for the nurse, Ryan was a handful for Mike (but what's new). When we got home, we took Reagan for a little stroll in her tricycle (which needs some adjustment) and Ryan went swimming with Daddy. 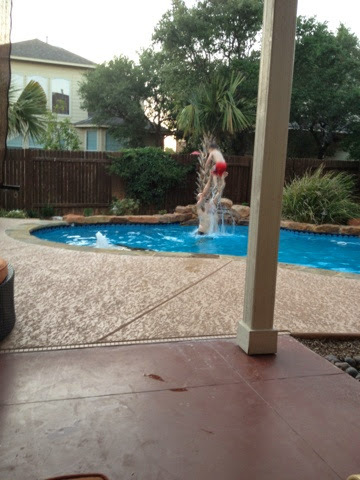 He had a blast and we sat on the back porch for a while watching him. He's fearless now and with his floatie on he can get around the pool from one side to the other without assistance! Afterward we went for a walk and Ryan had the biggest tantrum EVER! I eventually just called Mike and had him come pick us back up! Tonight Reagan's been great but after Mike laid her down, he came back downstairs with her extension still attached to a portion of her gj-tube! The damn thing is broken and we now have no way to attach her formula tonight or give her medicines in the morning! To say I'm freaking out is an understatement! Please keep it in your prayers that we're able to get a new tube for her tomorrow and that we avoid any major crisis! Reagan slept well last night, but she was up and at em early at 6:20am (as was her brother)! She was super wonderful today! Very smiley, very sweet! Just perfect. Great head control. She had speech and school today and she did great for both. Words really can't describe how wonderfully precious she's been today. SO thankful for days like these. Today we also took her brother in to the doctor. He tested negative for strep, so the doctor thinks he probably has a virus that mimics strep (like adenovirus). He also said that it's very common for older kids with chronic ear infections to still get a couple more infections after getting their tubes in. I'd like to clear this infection and never see another one, but he said it's possible he might get another before he's done with them for good. I'm just so ready for him to be able to hear out of BOTH ears!! Every day he's saying new words. Today it was big/little! So happy to see him progressing (even with just one ear)! Feeling very thankful for both of my kiddos today and ready for a great mother's day weekend with my mom!! Reagan slept well again last night. This morning I heard her make a noise and I went in only to find her on her side with her arm wedged on the side of her bed. Not sure if she was stuck or just had it there, but she had soaked through her diaper and onto her bed (I guess because she fell asleep so early last night). She was a little kooky this morning, but OK. She had a busy morning of therapy with vision/OT from the school, OT, and PT all before noon! She did great for everything and was able to finally get things moving on her own (two dirty diapers). Then she had a 1pm appt with the PM&R doctor. Just a 6month followup. One thing we discussed is trying to get some padding for the tray of her wheelchair. She keeps getting these mystery bruises on her arms (near her elbows) and we think it's from her banging her arms the tray of her wheelchair! Poor thing! She also elbows the bathtub too, but we think it's the tray. She was great, her brother was climbing the walls and driving me nuts, but she was great! Tonight we were thinking we were going to Bible study, when I was talking to Mike about Ryan constantly putting his fingers in his mouth. Right as I said that, he opened his mouth and Mike looked in and saw little pockets of pus all over his right tonsil (even though he's taking an antibiotic)! Poor guy! I guess he has a reason to be fussy! Bible study was a no go. He got increasingly fussy, so it's a good thing we didn't go. Looks like we'll be headed into the pediatrician tomorrow morning! Never a dull moment! Please keep our boy in your prayers! He really needs to catch a break! Between his ear infection that just won't go away, a green runny nose/sinus infection, and now this?!?!? Ugh! Thankfully Reagan seems to be doing much better. Today we've gotten smiles and even some laughs. Tonight when she was snuggled up next to me, she was so present and content...I love it! Such a darling girl! Reagan slept well last night. Let me elaborate a little on that. That, in and of itself, is a huge blessing that we don't take for granted! It's such a natural thing, like breathing, everyone does it and never thinks twice! 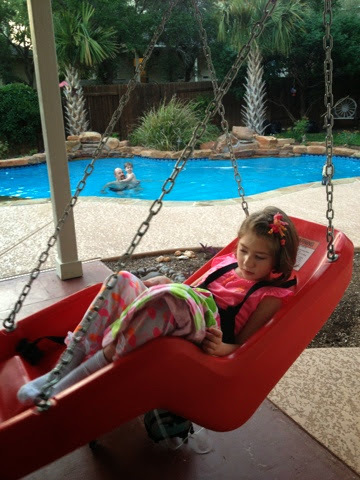 But for our mito/medically fragile/special needs kiddos, it doesn't come easy and at times it doesn't come at all! 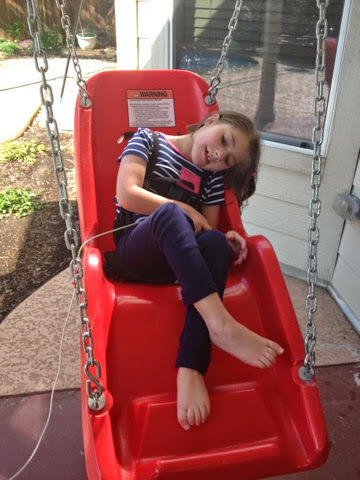 Reagan has certainly been in that boat way too often, days and days of no sleep and constant movement, to the point that we wonder how much longer her little body can tolerate it before it just gives out on her! It's a scary thing! Little Abigail is struggling with that right now! Poor girl, she's been through so much in the last week, and now she is plagued by the constant movements and unable to get any rest (even with tons of medication)! It breaks my heart! Please continue to keep her in your prayers! Reagan woke up with morning still very serious but calm. Making some gaggy faces here and there (with tongue sticking way out), but otherwise good, no actual nausea (of course we're still giving her Zofran around the clock). She's got three nasty looking mosquito bites on her arm from our outing Monday afternoon! Ugh! It was only 30 min or so, but that little bugger got her good! 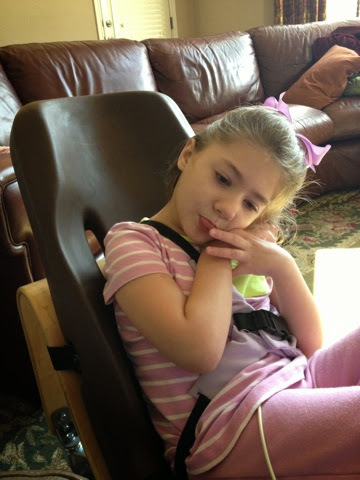 She had several therapies today and she did relatively well considering. So it would seem that we might be out of the woods and that maybe her cycles are changing a bit. That episode of crying Sun night and then again Mon morning might have been the extent of her bad cycle this go round. She seems to be in more of the recovery phase now (fingers crossed). Tonight she dozed off on her own really early (for her), around 9pm or so. So nice to see my girl sleeping peacefully! I will never take that for granted! Reagan slept like a rock last night! Thank goodness because it had been a couple nights of no sleep...she definitely needed it! She woke up this morning very tense (stiff as a board really), but OK. She was too "off" for vision therapy, but she did OK with PT and OT this afternoon. She actually fell asleep during OT! She seemed a little nauseous this afternoon (mouth movements, a little chokey, and tongue sticking out), but she never progressed. Tonight she was surprisingly calm while her brother proceeded to throw the biggest temper tantrum ever right in front of her! And then she dozed off on her own! No clue what to expect in the coming days, but I'm just thankful she's stable and finally getting some sleep. Ryan has been quite the handful today. He went in for his checkup (for his ears) and that one left ear is still infected! We're not sure if the antibiotic drops just aren't getting all the way in to treat the infection or if maybe it's just not the right antibiotic (they're sending out a sample for culture). So for now, we'll continue the drops and start him on an oral antibiotic for his sinus infection (and that might help clear the ear infection as well)! I told the doctor that we're already seeing major improvements in his speech and he said yeah, because he can hear now! He said we should see even more improvements once he can hear out of BOTH ears! Please keep it in your prayers that this infection clears up and stays away for good! Reagan was restless last night. I think she slept, but not sure how much or how well. She's been OK today. Not great but not bad either. Smiley one moment, furrowed brow the next. There are some things that are off, like her temperature regulation (cold clammy hands and feet and super sweaty back) and an increased sensitivity that indicate that she is headed in the wrong direction. Her new nurse was here today and everything went really well. 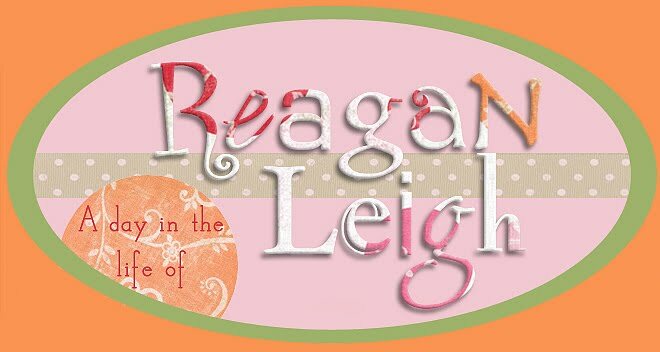 Reagan didn't give her too much of a hard time, but could tell something was bothering her. She was a little moany/grunty and definitely seemed to feel a little better once she had a poo! Tonight she was just SO tense, I wanted to hold her but she was kicking and fighting, it was not easy to do. The constant hand in the mouth...it's a battle and she usually wins. She's still got a runny nose and congestion that is driving her crazy! She fights to breathe out of her nose instead of just opening her mouth! I made the executive decision to start her on Zofran tonight just because there's a definite sense that things are escalating and maybe if we intervene soon enough, we'll minimize the damage! She's not looking sleepy at all tonight, even with the clonidine, hoping she settles down and gets some rest! It's been a weird day for my girl. Last night she slept but was a little restless. This morning she woke smiling, but tense. She's been very vocal, which at times has escalated to what we'd consider fussing/moaning (but no crying). Something definitely seemed to be bothering her. She's still battling with congestion and wanting to breathe through her nose and multiple times she's gotten hiccups (which might indicate reflux issues). Tonight she was very restless and tense/vocal. I definitely thought she'd escalate but we managed to avoid that. I just hope she's able to get done rest tonight and wake up feeling better tomorrow. Our new nurse starts tomorrow, so I sure hope Reagan behaves herself! Ryan has given me a particularly difficult time today. Very fussy (lots of meltdowns), nose still running like crazy, and now coughing a bit too! He's been a handful. Taking off for the pool in the backyard (definitely time for a pool fence) and the street when he's in the front yard! Ugh. Today I was loading the dishwasher and he was playing nearby jn the kitchen. I looked over and there he was sitting in his highchair! No idea how he managed to climb up and into that?!?! 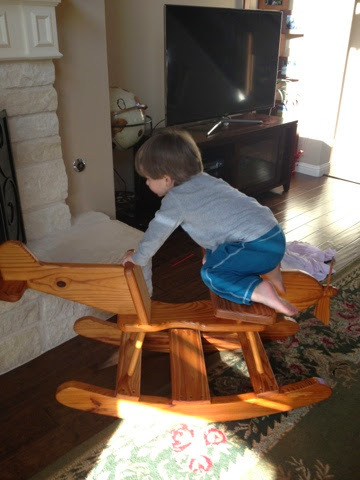 And several days ago he was contemplating climbing out of his crib! We were able to get his attention thru the monitor and he stopped, but boy oh boy are we going to be in trouble when he figures that out! And have I mentioned the hitting? Oh yeah, he loves to hit me, his sister, and unsuspecting kids at gymboree in the face! No idea how to stop that! Apparently it's something he only does around me, because his teachers say he doesn't do it at school (thank God)! Please continue to keep Abigail in your prayers!